We were married on June 7, 1997. Three months later, we moved into our first home, an 1800 square foot historic house in Staunton, Virginia, a city of about 25,000 located in the heart of the Shenandoah Valley. It had four bedrooms – perfect for our plans of beginning a family. Rob was working as a youth minister and part-time high school teacher and Robin was the second grade teacher in the same Catholic school as Rob. In arranging our house, we thought that it was important to keep one room set aside as a perpetual guest room, open to receive whomever Our Lord might send to us. We felt that this was a room that should be preserved as such even when we began having our own children. Little did we know how abundant God’s plans would be. After three years of marriage, it became clear to us that we were not able to have children. Several doctors could not find any obvious biological problems. We saw fertility specialists who finally said that the only hope for conception was in vitro fertilization – an option we were not willing to consider. We wanted the gift of children, but we did not want to manipulate and attempt to force a gift that Our Lord was not going to give us willingly. Then came the rush. Some friends of ours were on the board of the local foster unit of the Department of Social Services (DSS). They had a five-month old baby boy in their care who would eventually be free for adoption, once the parental rights had been terminated. But before they asked if we were willing to take in the baby, they warned us: the previous two families who were offered this child turned him down because of the extensive intestinal and brain damage he had suffered as a result of his birth mother’s illegal drug use. They thought he would likely not talk, not walk, and may eventually end up institutionalized. On April 21, 2000, Christopher was brought to our home. We never looked back. In late June, we were approached again. This time, there were two little girls, five years old and nine months old. Would we be willing to accept them as likely adoptive children? Of course! So on July 8, less than three months after Christopher came to us, we were joined by Lisa and Lorianne. Our permanent guest rooms were now full, and we began to look for a larger home. In the meantime, Rob moved to a full-time teacher position at the school and Robin took a year off, providing after school care in our home as she began the all-important role of being mother to our three new children. We did eventually move around the corner to an old Victorian house, giving us more space. For two years we continued raising our awesome children and doing our best to form them in the ways of the Church. In July of 2002, DSS called again. This time, they had an eleven-month old baby, the youngest of three who were removed from their family. They were expecting that after 3-4 months, the children would be placed back with their birth parents, once things had settled down. Samantha came to us unable to crawl, speak, make facial expressions, hold herself up, or even reach for things. Her initial doctor visit suggested that she might be paralyzed from the waist down, since she did not respond to any stimuli there. Her two other sisters, Shelby and Sabrina, were placed with another foster family. DSS did not want to place all three with us because they were concerned about the level of care that Samantha would require. All three girls had spent their days locked in a storage facility while their parents went to work. They were fed apple juice and Twinkies. Samantha just had apple juice and had lost weight since her eight-month checkup. We could see her bones, she was so thin. The next two years brought with them quite a trial. It was during that time that Christopher’s birth parents’ parental rights were terminated through a series of lengthy court hearings. Likewise, the legal process for Lisa and Lorianne came to a close. This allowed us to have the three kids baptized. Up until that time, we were not the permanent parents of them. Therefore, we could not reasonably promise (as is required at an infant baptism) to raise the children Catholic. Only after the adoption was finalized, were there no longer any obstacles to the responsibilities of Baptism. During these two years, it also became more and more evident that Samantha’s birth parents were not able to care for their children. The goal changed from returning the girls to their biological parents to moving them to a permanent placement. That permanent placement was with us. 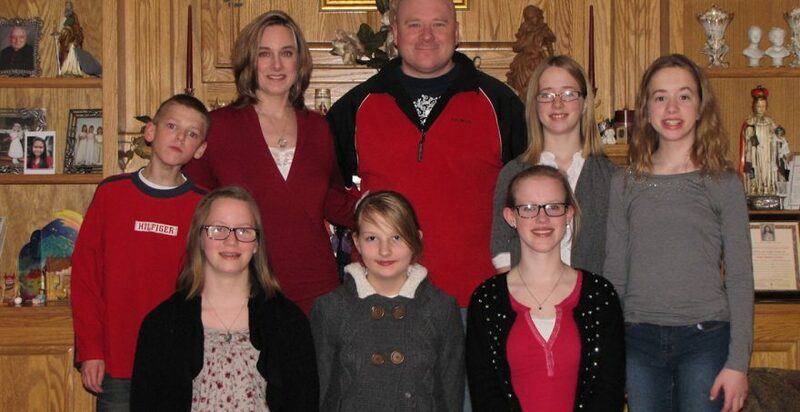 In the summer of 2004, then, our family welcomed Shelby and Sabrina, bringing us to a total of six children. Two years later, feeling a call to move to Robin’s hometown and wanting to start over as a forever family, we moved to Omaha, Nebraska. As we write this article, Lisa (18) is a freshman in college. Lorianne (14), Shelby (13), and Sabrina (12) attend a Catholic school here in Omaha. Christopher (13) and Samantha (11) attend a Catholic special needs school in town. Rob is actually the principal of this school, and Robin works for the Family Life Office of the Archdiocese of Omaha. Along the way, we have had some trials and some great joys. One question we decided to settle very early on was about communicating the facts of their adoption to our children. From the time they entered our home, they knew that we were their “forever parents” (adoptive parents) and they came from their birth parents. We worked hard to make it clear that their birth parents loved them, but were not able to care for them. We taught them that God brings tremendous good out of bad situations, and that is how we became a family: a family that God put together from painful situations, a family called to bring healing and joy to one another and everyone we meet. As the kids would age, we disclosed more and more information about their previous situations to the extent that they could understand. About twice a year we do Google searches for their birth parents. Twice, these searches revealed deaths: Christopher’s birth mother had committed suicide in an overdose, and Samantha, Sabrina, and Shelby’s birth mother had died of an illness. We told our children and worked through the grief and conflicting emotions with them. We have remained very open about their respective situations. At first, we had a fear that if we told our children too much, perhaps they would want their birth parents instead of us. This fear faded over the years, as the love and trust in our family deepened. The difficulties that come from adopting out of foster care are certainly present. When children are ripped from their birth parents (even if the birth parents are not doing their job well), they are hurt in the process. There is no doubt about it. That pain enters into the adoptive family, and God is calling on the new family to be the method of healing. For us, this meant helping our children deal with permanent brain damage, severe learning difficulties, epilepsy, attachment issues, major depression, and even suicide attempts. If you would have asked us back in 1997 if were ready for all that, we would have said, “No way!” But Our Lord provided the grace, the people to help, and the love to bring healing not only to our children, but to us as a couple as well. The joys of adopting, however, far outweigh any difficulties. These joys are no different, perhaps, than any other family who gave birth to their children. We will say, though, that our children, maybe because of their origin and adoptions, have a tremendous heart for anyone who is downtrodden, suffering, or poor in any way. They are very quick to reach out and want to help those in need – those who stand in the same position they once stood. Seeing this is for us one of the greatest joys of adopting: our own children seeking to show the generosity that they were shown. In his apostolic exhortation Familiaris Consortio (The Role of the Christian Family in the Modern World), Bl. Pope John Paul II named “serving life” as the second of four tasks of the family. God did not give the Lairds the ability to serve life through procreation and birth. Instead, He gave us the gift of serving the lives of those children He placed before us, and we are ever grateful for this gift. It has created our family and has transformed us as persons. For families considering adoption, we have this to say: If Our Lord places the desire in your hearts, then go for it! All the difficulties begin to fade away when your brain damaged son throws a touchdown pass in the Special Olympics, or your daughters give money for less fortunate classmates to buy snacks after school, or your oldest daughter seeks a profession to help those who struggle to overcome the difficulties she once faced. Our family is not perfect, far from it. But in the end, the family that God put together has helped each of us follow Him more closely. And isn’t that the mission of the family? Rob and Robin Laird, pictured above with their children, were married on June 7, 1997. Rob is the Principal of Madonna School, a Catholic school serving students with special needs, and Robin is the Coordinator of Marriage and Family Ministries for the Archdiocese of Omaha. They currently reside in Omaha, Nebraska with their six children, Lisa, Lorianne, Christopher, Shelby, Sabrina, and Samantha.